While there are certainly tablets on the way that are more anticipated than the Flyer, HTC's 7" slate is coming nonetheless - and now we know when. 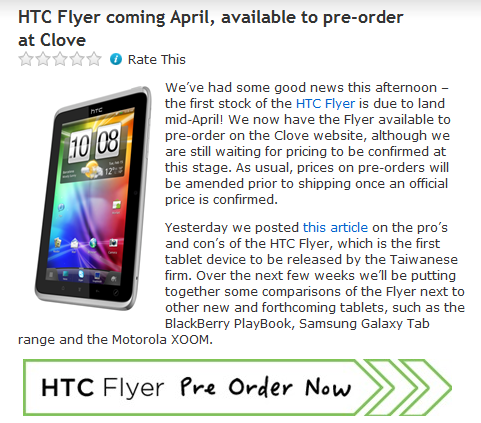 It will launch "mid April," according to UK site Clove, which is now taking pre-orders for the tablet. Accessories that will be available for purchase along with your flyer include a spare digital stylus (£40), a Micro USB to HDMI cable (£24), and a car charger (£17). Previous rumors suggested the stylus-toting tablet would set one back $600 in the US, and the £500 price point Clove has set totals out to £600 after VAT, so take what you will from that. For a single-core Android tablet running Gingerbread, we aren't convinced that this will be a huge hit for HTC, but at least we have word of a 10" Honeycomb tablet that will be arriving from the Taiwanese manufacturer later this year. If any of you in the UK have been holding out for HTC's initial tablet offering, you can head over to the source link to get your pre-order on.